Eternity will reveal that holding out is losing out. The message of All In is simple: if Jesus is not Lord of all then Jesus is not Lord at all. It’s all or nothing. The Gospel costs nothing. You can’t earn it or buy it. It can only be received as a free gift compliments of God’s grace. It doesn’t cost anything, but it demands everything. 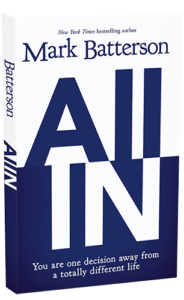 It demands that we go “all in,” a term that simply means placing all that you have into God’s hands. Pushing it all in. And that’s where we get stuck―spiritual no man’s land. We’re afraid that if we go all in that we might miss out on what this life has to offer. It’s not true. The only thing you’ll miss out on is everything God has to offer. And the good news is this: if you don’t hold out on God, God won’t hold out on you. Readers will find Batterson’s writing filled with his customary vivid, contemporary illustrations as well as biblical characters like Shamgar and Elisha and Jonathan and . . . Judas.